Last night's stream consisted of us checking out the early access version of Gunnheim, a twin stick shooter out on the PC via Steam's Early Access program. 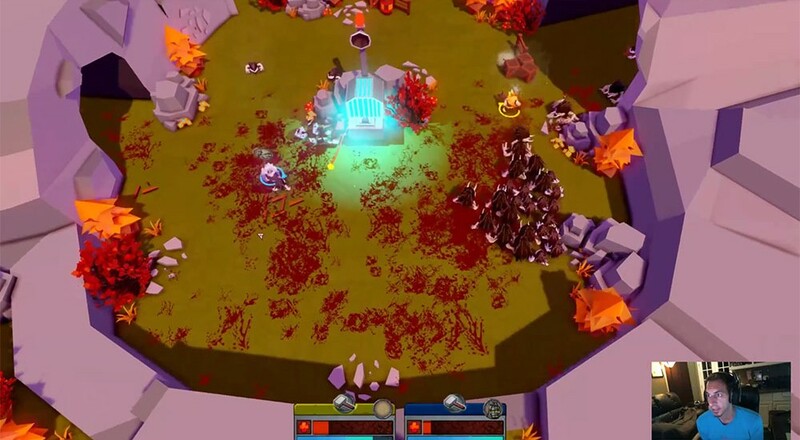 With four player co-op, players are thrust into a polygon art style filled world inspired by Viking mythology taking on random levels and objectives. Here's our playthrough and some rough impressions. There's some solid groundwork here for Gunnheim, though there's only two characters to choose from the game does support four player co-op. That said we found the level design a bit too tight for that many players with several ledges (sometimes difficult to see) becoming perilous. The friendly fire also becomes problem some in the tight enclosed spaces of some levels and the fact that you revive with one hit worth of health can be infinitely frustrating. All that said, Mike and I managed to play the game for an hour straight and have quite a bit of fun through twelve levels and two boss battles. The high points of the game are definitely in the style both graphically and in its audio design. The special weapons are a ton of fun to use, though the special powers feel a bit lacking. This is an arcade game for an arcade game's sake and with just a little bit of glue to hold it all together, it could become a solid title for just $10. Page created in 1.1975 seconds.